SALUTE HISTORIC RALLY AND CONVENTION IN BARNALA IN PUNJAB TODAY CONDEMNING FASCIST GENOCiDE IN TUTICON AND GADRICHOLI AND WITCH HUNT ON ACTIVISTS .SHIMMERED THE TORCH OF RESISTANCE TO EXTINGUISH THE FASCSIM PERVADING IN INDIA TODAY. 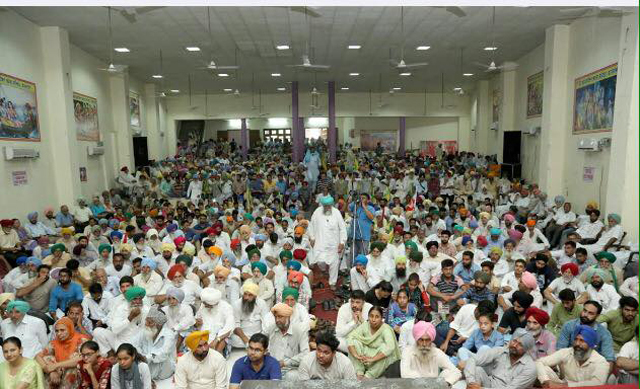 Salute this historic convention in Barnala today organised by democratic front against operation greenhunt Punjab.,shimmering the torch of liberation from the clutches of fascism .The presidium comprised of dr Parminder Singh,Profressor Jagmohan Singh and AKMaleri.The main Speakers were Varavara Rao andArundhati Roy.A major event in building revolutionary resistance to fascism.An inspiration to people of the whole world.Most qualitative significance with around 300people attending.Speakers condemned massacre of Gadricholi and tuticon,False framing of democratic activists and conspiratorial charges on Maoists for plotting to kill pm.Tribute to meticulous efforts of Democratic Front against Operation Green hunt.Adressed by 2. 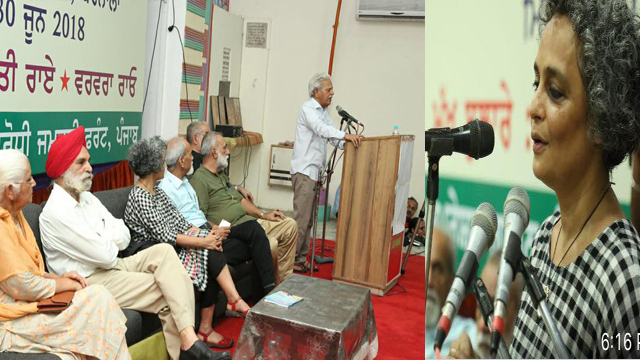 Of Indiaʹs greatest crusaders for liberation in Varavara Rao and Arundhati Roy.Gathering represented the voice of the entire oppressed masses of India. Varavara Rao highlighted the massacres in gadricholi and tuticon and summed up the state repression.,particularly in Telengana and Dandkaranya..He narrated how over 15000 comrades were languishing behind the bars without any proper trial. And how laws like article 160 were used to enforce police deployment in areas.He spoke on how the govt unleashed repression in 1997,2007and later.The brutal assassination of Adivasis in gadricholi and a farmers in Tuticon was recalled and the murders of leaders falsely portrayed as encounters.He summarised how the Maoist led resistance of the Adivasis was a thorn in the flesh for the corporate giants by preventing their entry,He went on to explain how no land reforms promised by the state were implemented in practice and state suppressed any possible resistance of Adivasis to procure land.Rhe Rohit Vemula suicide and subsequent events was also touched upon. Arundhati Roy spoke at the micro level.She described how now robots were infiltrating every walk of life and ultimately kill the job aspirations of millions .She called upon the people to resist the micro fascism which she felt would replenish the entire workforce from the factories to the fields.She also spoke about the fascist murder do ov activists and journalists in Kashmir and how virtually fascism took over in those regions. What do as remarkable was the patience and intensity the audience mainly comprising the peasantry displayed revealing the painstaking ground work in class struggles.The event concluded with a Marj of around 150 persons to the railway station from the venue.An event of immense qualitative significance in educating the broad masses.Above all they could relate the speeches to the day to day struggles of their lives.An ideal example of how a democratic revolutionary ant-repression platform should function not being a front organization of any political group or trenda nd should be emulated all over the nation.